George Dannatt was a Vice-President of the Society from its inauguration in 2003 to when he accepted the Society's invitation to become its President after the death of Lady Bliss in November 2008. George Dannatt died on 17 November 2009. From the Chairman: It was with great sadness that we learnt of the death of our President, George Dannatt. I had spoken to him on the telephone only a few days before. As usual he said that he was very busy, but despite telling me he had not been very well, was very much looking forward to a meeting we had been arranging for the following week. I was going to take one of our Vice-Presidents, Ian Venables, together with Meurig Bowen, Music Director of the Cheltenham Festival, to meet George. We were hoping to discuss the possibility of the Metamorphic Variations being performed again in Cheltenham; this time it would be the complete work, and thus a première. I had mentioned to Meurig the possibility of having an exhibition of George’s paintings at Cheltenham if a major Bliss work was in the programme – George then told me that Lady Bliss had arranged an exhibition of some of his paintings at Cheltenham when the Metamorphic Variations were performed there during Bliss’s time as President of the Festival. Lady Bliss (Trudy) introduced my wife and me to George and Ann Dannatt over thirty years ago and they became great friends. It was from George that I learnt a lot about Bliss’s music. It was a particular set of George's paintings called Tantris that inspired Bliss to compose the Metamorphic Variations, which were dedicated to George and Ann. George’s paintings depicting the Colour Symphony are some of his greatest works. The Blisses were friends of the Dannatts for many years, and loved staying at their home with its unique atmosphere, beautiful gardens, his studio hidden in the trees and the wonderful peaceful quality. I arranged a few committee meetings at their home: George loved to see us and was in his element talking about Bliss and his music. We always valued his showing us letters he had received from Arthur, and also his many treasured archives of the music – we felt that we were very close to the composer on these visits. George was a very special, unique person, and still working hard on so many things at the age of 94. I loved to exchange banter with him: he had a wonderful dry sense of humour. Normally he would complain that he was really too busy to see us but he never really meant it, as nothing pleased him more than to have a meeting at his house. He and Ann were wonderful hosts. Chartered surveyor, artist, music critic and - not so well known - a composer and a very good pianist. A man of many talents. He was only our President for a short time, but as Vice-President from the formation of the Society in 2003 he took a great interest in our work and achievements. He was especially proud of the Newsletter and the success we are having in interesting performers and the general public in the music. It was a sad coincidence that George died within a few days to a year after the death of Lady Bliss: on that very day we were all at his house having a Committee meeting when the news came through. He was not only our President but also a great friend to many of us, and will be sadly missed. A unique tribute to George and his friend Arthur would be performances once more of the Metamorphic Variations and the Colour Symphony at the Cheltenham Festival. I shall do my best to bring this about with, I am sure, the support of every member of our Society. His obituary appeared in the Times on 26 November 2009. The Independent's obituary appeared on 28 December. From our Vice-President in 2003: On behalf of Lady Bliss I offer this message of appreciation, welcome and goodwill to The Arthur Bliss Society, of which she is President. I join with her in that welcome, for I am intensely aware of the loss which we in England suffer through the continual pushing aside of many truly important British composers. This is nothing new - how seldom one hears often of a powerful and lyrical symphonic structure by, say, Alwyn, Bax, Bantock, Delius, Lambert, even that by Vaughan Williams himself. Though one needs to be 'in the know' to appreciate it, quite a lot of Bliss's work does appear, but not enough, which is why the enthusiastic and dedicated group from Cheltenham (where Bliss was President of the famous and long-running annual Festival of Music) have created this Society. Checkmate, one of the most original of contemporary ballets, has its revivals; Morning Heroes, a powerful reminder of the horror and futility of war, arises on appropriate occasions. And now, with the issue of CDs by the original soloist, Solomon, and Mewton-Wood, has come that authoritative Piano Concerto, a work which at last is becoming established in the repertoire of those pianists brave and tough enough to tackle it. From my close relationship with the Society's Committee, I know full well that these words apply too to their approach. They are to be commended, and joined. George Dannatt was a chartered surveyor by profession, and had been closely involved in the study of music since his fifteenth year: he studied piano and composition with Harry Farjeon and Norman Franklin. Despite his conscription into the Army in 1940, he wrote his first music criticism in the monthly Musical Record in 1941. Invalided in 1944, he resumed work as a surveyor, and also regular music criticism on the News Chronicle, Penguin Music Magazine and other writing commitments. He was elected a member of the Critics' Circle in 1948 and then an Honorary Member. He was strongly aware that the need for precision and detail in those two professional careers led him to pursue his interest in contemporary painting, and he worked as an abstract-constructivist artist since 1956, when he became closely involved with the West Penwith painters and sculptors. 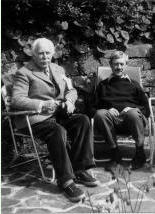 Arthur Bliss was deeply interested in George's work as an artist, and considering their interrelated ideas and activities, it is not surprising that George wrote extensively upon Bliss's music and upon aspects of their twenty years' close friendship.